Global Community Ministry of World Population. Intensive farming practices, including an immense use of genetically modified foods, have also played a significant role in allowing the current growth of the human population and will likely continue to play such a role in the future. Finally, immigration, which will not affect the overall world population figure, can lead to localized overpopulation and cause an uneven distribution of natural resources. We must alert and organise Global Community to pressure world leaders to take specific steps to solve the two root causes of our environmental crises: exploding population growth and wasteful consumption of irreplaceable resources. Overconsumption and overpopulation underlie every environmental problem we face today. Global Community defines 'overpopulation' in a very specific and innovative way. Overpopulation is defined more than just population density, but it is better defined as the number of people in an area exceeding the resources and the carrying capacity of the environment necessary to sustain human activities. Carrying capacity is the maximum number of individuals of a species that can exist in a habitat indefinitely without threatening other species in that habitat. It would be difficult to argue that humans are not threatening other species. Overpopulation occurs when the population density is so great as to actually cause an impaired quality of life, serious environmental degradation, or long-term shortages of essential goods and services. When we compare lifestyles of the developed countries vs. the developing countries, the developed countries have a much greater responsibility. As an example, Americans constitute less than five percent of the world's total population, but consume 30% of the world's energy. Just as much as the population size, we need to consider the resources consumed by each person, and the damage done by technologies used to supply them. Overpopulation is when the number of people can not be permanently maintained without depleting resources and without degrading the environment and the people's standard of living. Because we are rapidly increasing the number of people in the world using up more resources, virtually all nations are overpopulated. This applies even more so to the developed nations. As we use up more the resources, the earth's carrying capacity continues to decrease. As of 1 January 2016, the world's population was estimated to be 7,432,663,008. It is currently growing by approximately 76 million people per year. Assuming a decrease in average fertility rate from 2.5 down to 2.0, current United Nations predictions estimate that the world population will reach 9.0 billion around 2050. Almost all growth will take place in the less developed regions, where today's 5.4 billion population of underdeveloped countries is expected to increase to 7.9 billion in 2050. By contrast, the population of the more developed regions will remain mostly unchanged, at 1.2 billion. An exception is the United States population, which is expected to increase by 45% from 2016 to 2050. Global life expectancy at birth is expected to continue rising. In the more developed regions, the projection is to 85 years by 2050. Among the least developed countries, it is expected to increase to 70 years by 2040. Between now in 2016 to 2050, the net number of international migrants to more developed regions is projected to be 200 million. Because deaths are projected to exceed births in the more developed regions by 64 million during the same period, population growth in those regions will largely be due to international migration. How is this human overpopulation possible? Medical advancements, increases in agricultural productivity, poverty and lack of education, and poor government leadership are the main reasons. Legitimate leadership is an act of service. Those in power must show a primary interest in the good of the collective ahead of their self-interest. In this way, true leaders are mission-centered rather than self-centered. Global Community exerts strong global leadership on multinational solutions to pressing health, overpopulation, overconsumption, environmental, and other problems. We should propose innovative new solutions and show leadership in carrying them out, especially in areas such as clean energy development, water resources, and overpopulation. In the developed regions, there has been a decline in mortality rates and a rise in birth rates, largely due to medical advances, which have provided more effective ways to control epidemics, treated most health ailments, and brought more effective solutions to infertility problems and safer pregnancies. Advancements in medicine have also led to an increase in the average life expectancy of humans and good prenatal care. Health care, education and development programs have improved the chances of survival for both the mother and the baby. There are social pressures, mostly from families, to have early marriages and children, especially within an uneducated class where family planning is often not present. Modern methods of birth control and family planning usually don't reach the illiterate populations of society and some cultures promote beliefs and expectations to marry at a certain age or have a certain number of children. The 60 poorest countries on earth are also those with the highest fertility rates. Approximately 300 million women around the world would like to delay or end childbearing but have no access to contraception. Family planning would improve maternal and infant health and allows women to be more active in society. Overpopulation in various countries has become an important obstacle to any attempt to organize peace on our planet. Overpopulation leads to increased levels of tensions both between and within countries. Overpopulation may promote warfare through fear of resource scarcity and increasing numbers of youth lacking the opportunity to engage in long time employment. For too long we have focused on how much we can take from our ecosystems, with little attention to the services that they provide. Ecosystems provide essential services such as climate control and nutrient recycling that we cannot replace at any reasonable price. The world's coastal, forest, grassland, freshwater and agricultural ecosystems reveals a widespread decline in the condition of the world's ecosystems due to increasing resource demands of an overpopulated world. The decline could have devastating implications for human development and the survival of all life. Each ecosystem produces goods and services that the world has been relying on in the past. These goods and services include production of food, provision of pure and sufficient freshwater, storage of atmospheric carbon, maintenance of biodiversity and provision of recreation and tourism opportunities. The capacity of Earth's ecosystems to produce many of the goods and services we depend on is rapidly declining. As the planet becomes less hospitable and more people depend on fewer available energy options, our standard of living and survival become increasingly vulnerable to drastic changes. Environmentalists have long been concerned about the natural resources threatened by rapidly growing human populations, focusing on phenomenon such as deforestation, desertification, air pollution and global warming. But the worst-case scenario for people experiencing overpopulation is a lack of fresh, clean water. Human overpopulation is a major driving force behind the loss of ecosystems, such as rainforests, coral reefs, wetlands and Arctic ice. Rainforests once covered 20% of the Earth's land surface, now they cover a bare 5% and at the current rate of deforestation, the last remaining rainforests could be consumed in less than 40 years and certainly by the end of the century. Many people prefer to move to developed countries like US, UK, Canada and Australia where best facilities are available in terms of medical, education, security and employment. The end result is that those people settle over there and those places become overcrowded. Human overpopulation is an other lifeform rights issue as well as an environmental issue and a human rights issue. The species extinction crisis threatens to grow out of control with climate change, and energy demands of a rapidly growing Global Community. Human activities, including mining, transportation, pollution, agriculture, development, and logging, take habitat away from other species. These activities also contribute to climate change, which threatens even the most remote wild habitats on this planet and our own survival. The entire planet and virtually every nation is already vastly overpopulated. Africa is overpopulated now because its soils and forests are rapidly being depleted which implies that its carrying capacity for human beings will be lower in the future than it is now. The United States is overpopulated because it is depleting its soil and water resources and contributing mightily to the destruction of global environmental systems. Europe, Japan, the Soviet Union, and other rich nations are overpopulated because of their massive contributions to the carbon dioxide buildup in the atmosphere. More than 80% of the world’s old growth forests have been destroyed, wetlands are being drained for real estate development, and demands for biofuels take much-needed arable land away from crop production. Life on earth is currently experiencing a major extinction, as we are losing an estimated 40,000 species per year. The major extinction that we are now facing is the first that is caused by a single species: humans. The effects of overpopulation are quite severe. The first of these is the depletion of resources. The Earth can only produce a limited amount of water and food, which is falling short of the current needs. Most of the environmental damage being seen in the past decades has been because of the growing number of people on the planet. As human populations grow, so will the problems of food and clean freshwater availability. As the human population continues to grow, finite natural resources, such as fossil fuels, fresh water, arable land, coral reefs and forests, continue to plummet, which is placing competitive stress on the basic life sustaining resources and leading to a diminished quality of life. Human consumption has by far outstripped available resources. Each person on Earth now requires a third more land to supply his or her needs than the planet can supply. World's ecosystems have changed more rapidly in the second half of the twentieth century than at any time in recorded human history, and virtually all of Earth's ecosystems have now been significantly transformed through human activities. With an out of control increasing world population, the problems created by overpopulation grow correspondingly. The world's ecological capacity is simply insufficient to satisfy the ambitions of China, India, Japan, Europe and the United States as well as the aspirations of the rest of the world. The world's population will soon reach a level where there will not be enough resources to sustain life as we know it. Growth must be checked to avoid this catastrophe. Many environmental, social, and economic problems either stem from or are increased in magnitude by the overpopulation problem. Overpopulation in developing countries puts a major strain on the resources it should be utilizing for development. Food security becomes more difficult to achieve as resources run out. Resources in danger of becoming depleted include oil, phosphorus, grain, fish, and water. Supplies of energy, food, and water will need to be increased by 60% to reach demand levels of 2030. Food supplies will need to be increased by 80% by 2050 to meet projected demands. Another resource, which cannot keep up with an increasing population is water. The supply of freshwater is limited. Conflicts over water are becoming a source of tension between countries, which could result in wars. Conflicts ensue between farmers, municipalities, environmentalists, and others over water rights. Creating freshwater can be expensive. A swelling population may have to turn to desalinization for their clean water. Different cities have what is known as “water rights” from a certain mountain area’s snowmelt, or certain freshwater lakes and streams. There are more people consuming water, however, than being replaced and the result is that we now have dried up lake beds which create dust particles. These dust particles are then polluting the environment and the air we breathe. So, not only is there not enough fresh water for the current population to drink, but the air is getting polluted with dust particles that contribute to health problems. On our planet, 75% of the surface is covered in water, 96% of that is ocean and 4% is freshwater, 65% of freshwater is divided into glaciers and ice caps and the remaining 35% into land surface water, such as rivers, lakes, ponds and groundwater. Most of the freshwater resources are either unreachable or too polluted, leaving less than 1% of the world's freshwater, or about 0.003% of all water on Earth, readily accessible for direct human use. By year 2030, more than half of the world population will be facing water-based vulnerability and human demand for water will account for 65% of all available freshwater. In some developing regions, water demand will exceed supply by 50%, and nearly half of the world's people will be living in areas of acute water shortage. Freshwater is the most fundamental finite resource with no substitutes for most uses, yet we are consuming freshwater at least 10 times faster than it is being replenished. In regions of northern Africa, the Middle East, India, Pakistan, China, and the U.S. freshwater ecosystems, that is the diverse communities found in lakes, rivers, and wetlands, may be the most endangered of all. Freshwater ecosystems have lost a greater proportion of their species and habitat than ecosystems on land or in the oceans; in addition, they are probably in greater danger of further losses from dams, pollution, overfishing, and other threats. Freshwater ecosystems are quite limited, covering less than 1 percent of the Earth’s surface, and they are highly diverse and contain a large number of the world’s species. With the imbalance growing between population numbers and vital life sustaining resources, people of Global Community must actively conserve cropland, freshwater, energy, and biological resources. There is a need to develop renewable energy resources. Usable land may become less useful through salinization, deforestation, desertification, erosion, and urban sprawl. Global warming may cause flooding of many of the most productive agricultural areas. The development of energy sources may also require large areas, for example, the building of hydroelectric dams. Thus, available useful land may become a limiting factor. By most estimates, at least half of cultivable land is already being farmed, and there are concerns that the remaining reserves are greatly overestimated. In Africa, if current trends of soil degradation and population growth continue, the continent might be able to feed just 20% of its population by 2030. Human populations predictably grow and shrink according to their available food supply. Only 40% of the land area of the globe is dedicated to agriculture, and there is not room for much more. Although plants produce 62 billion metric tons of carbohydrates per year, when the population is expected to grow to 9 billion by 2050, the plants may not be able to keep up. Food supply is a primary example of how a resource reacts when its carrying capacity is exceeded. By trying to grow more and more crops off of the same amount of land, the soil becomes exhausted. Because the soil is exhausted, it is then unable to produce the same amount of food as before, and is overall less productive. When we are talking about overpopulation, we should first understand the causes of it. Overpopulation is caused by a number of factors. Reduced mortality rate and better medical facilities are a few of the causes which resulted in overpopulation. Growing advances in technology with each coming year has affected humanity in many ways. One of these has been the ability to save lives and create better medical treatment for all. A direct result of this has been increased lifespan and the growth of the population. In the past decades the growth of population has boomed and has turned into overpopulation. In the history of our species, the birth and death rate have always been able to balance one another and maintain a population growth rate that was sustainable. The massive growth in developing nations is due in large part to fertility rates, where women during their reproductive years will have an average of five children. That's considerably higher than it is in the developed world. In addition to the growing demands of developing nations, emerging countries like China and India are rapidly industrializing. Their demands for food alone will have considerable impact on global markets. In simple terms, at the root of the problem of overpopulation is the difference between the overall birth rate and death rate in populations. If the number of children born each year equals the number of adults that die, then the population will stabilize. Talking about overpopulation shows that while there are many factors that can increase the death rate for short periods of time, the ones that increase the birth rate do so over a long period of time. The discovery of agriculture by our ancestors was one factor that provided them with the ability to sustain their nutrition without hunting. This created the first imbalance between the two rates. Following this came the industrial revolution. Technological advancement was perhaps the biggest reason why the balance has been permanently disturbed. Science was able to produce better means of producing food, which allowed families to feed more mouths. Medical science made many discoveries thanks to which they were able to defeat a whole range of diseases. Illnesses that had claimed thousands of lives till now were cured because of the invention of vaccines. Combining the increase in food supply with fewer means of mortality tipped the balance and became the starting point of overpopulation. Birth rates are lowest in the developed nations, which also have the highest access to food. In fact, some developed countries have both a diminishing population and an abundant food supply. This shows that, limited to the scope of the population living within a single given political boundary, particular human populations do not always grow to match the available food supply. However, the global population as a whole still grows in accordance with the total food supply and many of these wealthier countries are major exporters of food to poorer populations, so that, it is through exports from food-rich to food-poor areas that the population growth in these food-poor areas is further fueled. The human population is, on the global scale, undeniably increasing, as is the net quantity of human food produced, a pattern that has been true for roughly 10,000 years since the human development of agriculture. The world has become a globalized system with food moving across national borders from areas of abundance to areas of scarcity. With the latest technological advancements and more discoveries in medical science, it has become possible for couples who are unable to conceive to undergo fertility treatment methods and have their own babies. Today there are effective medicines which can increases the chance of conception and lead to rise in birth rate. Many people prefer to move to developed countries like US, UK, Canada and Australia where best facilities are available in terms of medical, education, security and employment. The end result is that the places of work people who settled over there became overcrowded. Difference between the number of people who are leaving the country and the number of people who enter narrows down which leads to more demand for food, clothes, energy and homes. This gives rise to shortage of resources. Though the overall population remains the same, it just affects the density of population making that place simply overcrowded. Most developing nations have a large number of people who are illiterate, live below the poverty line and have little or no knowledge about family planning. Getting their children married at an early age increase the chances of producing more children. Those people are unable to understand the harmful effects of overpopulation and lack of ignorance prompts them to avoid family planning measures. Biodiversity is the sum of all living organisms on the planet and makes life on Earth livable for our species. Biodiversity is the basis for ecological services that range from water filtration to food production to carbon cycling, and are worth tens of trillions of dollars per year. The largest single threat to the ecology and biodiversity of the planet in the decades to come will be global climate disruption due to the buildup of human-generated greenhouse gases in the atmosphere. The effects of climate change are profound and far-reaching. Learning the hard way that we can't separate the economy from the ecological systems that support it, climate change, perhaps the greatest challenge and threat to humanity, has been left largely unchecked by world leaders. And of course, over the past decades, this threat to humanity was caused by activities of an overpopulated planet. Directly related to maintaining the health of the human population is water supply, and it is one of the resources that experience the biggest strain. With the global population at about 7.433 billion, and each human theoretically needing 2 liters of drinking water, there is a demand for 14.87 billion liters of water each day to meet the minimum requirement for a healthy living. Weather patterns, elevation, and climate all contribute to uneven distribution of fresh drinking water. Without clean water, good health is not a viable option. Besides drinking, water is used to create sanitary living conditions and is the basis of creating a healthy environment fit to hold human life. In addition to drinking, water is also used for bathing, washing clothes and dishes, flushing toilets, a variety of cleaning methods, recreation, watering lawns, and farm irrigation. Irrigation poses one of the largest problems, because without sufficient water to irrigate crops, the crops die and then there is the problem of food rations and starvation. In addition to water needed for crops and food, there is limited land area dedicated to food production, and not much more that is suitable to be added. Water deficits, which are already stimulating heavy grain imports in numerous smaller countries, may soon do the same in larger countries, such as China or India. The water tables are falling in overpopulated countries such as Northern China, the US, and India owing to widespread of extracting groundwater beyond sustainable yields. Other countries affected include Pakistan, Iran, and Mexico. This overdrafting is already leading to water scarcity and cutbacks in grain harvest. Even with the overpumping of its aquifers, China has developed a grain deficit. This effect has contributed in driving grain prices upward. Most of the 3 billion people projected to be added worldwide by mid-century will be born in countries already experiencing water shortages. One suggested solution is for population growth to be slowed quickly by investing heavily in female literacy and family planning services. Desalination of the global ocean salted water is also considered a viable and effective solution to the problem of water shortages. Massive government mismanagement and growing human needs for water are causing freshwater ecosystems to collapse, making freshwater species the most threatened on Earth with extinction. While freshwater ecosystems cover only 0.7% of the earth's surface, they contain roughly 12% of all species, including more than 40% of all vertebrates. Freshwater species in rivers, lakes, ground waters, and wetlands provide a diverse array of vital natural services - more than any other ecosystem type. Billions of people are at risk as biodiversity loss affects water purification, disease regulation, subsistence agriculture and fishing. Freshwater ecosystems and their species also absorb about 10% of the CO2 humanity is adding annually to the atmosphere. China faces a farming crisis as mass migration into the industrial zones of mushrooming cities eats up fertile land. Historically, the Chinese have spent most of their income on food, but to produce grains, vegetables and meat, the country must retain enough arable cropland. Today China is importing more food and resources. The sustainable Chinese agriculture has been altered in favour of Western methods that harm the existing ecosystems. China's ability to feed its own people and the environmental destruction provokes serious concern. By 2030 Chinese demographers expect the population to level out nearer to 1.5 billion, but predicted that soaring grain imports would upset global markets. Water, more than grain or meat, might well be the crucial issue. As water becomes scarce, 80% of the grain crop is irrigated, as per-acre yield gains are erased by the loss of cropland to industrialization. Densely populated countries undergoing industrialization become food importers as the population shifts from rural to urban workers. The world is experiencing rising food prices. The Chinese government is mandating price freezes and subsiding various manufacturing and food industries. Water scarcity in China will impact the entire world; the country is experiencing a lack of potable water due to the environmental damage from rapid industrialization without any agencies to protect the ecology. China, with 20% of the world's population and 8% of the world's arable land, is losing even more land to industrialization. China's Ministry of Land and Resources noted that the country has lost 7% of its arable land in the past decade. Beijing has mandated that arable land cannot fall below 300 million acres. Desertification could drive tens of millions of people from their homes and put new strains on natural resources and on other societies nearby and threaten international instability. Governments are urged to work out ways to slow the advance of deserts, from the Sahara to the Gobi, caused by climate change and land over-use. Better plantings of crops and forests in nearby drylands were simple measures to help. Desertification currently affects 200 million people, and threatens the lives of a larger number. The loss of soil productivity and the degradation of nature pose imminent threats to international stability. About 50 million people are at risk of being forced from their homes by desertification in the next decade. The largest area is sub-Saharan Africa, where people are moving to northern Africa or to Europe. The second area is the former Soviet republics in central Asia. Improved crop and forestry plantings on drylands could slow desertification and help fight global warming. Millions of people could lose their homes and livelihoods as the world's deserts expand. More needs to be done to combat desertification, which has emerged as a global problem. Drylands make up more than 40% of the world's land surface and are home to two billion people. Up to 20% of those areas have suffered loss of plant life or economic use from desertification. Global warming was likely to exacerbate the problem, but human factors have played their part, with over-grazing, over-farming, misuse of irrigation and the unsustainable demands of a growing population contributing to environmental degradation. The world's poorest populations were likely to be among the worst affected, with areas of Central Asia and the north and south of the Sahara in danger of becoming unsuitable for farming. Desertification has been linked to health problems from dust storms, poverty and a drop in farm production. Rising greenhouse gases in the atmosphere are causing global temperatures to rise, which is leading to the melting of the polar ice caps, which in turn has resulted in rising sea levels and a host of ecological issues. The oceans have absorbed about a third of the CO2 humans have pumped into the air since industrialization, helping to keep earth's thermostat lower than it would be otherwise. The oceans are taking up the greenhouse gases that we dump into the air, which turns the waters deadly to its inhabitants. A significant amount of carbon dioxide in the atmosphere comes from the burning of carbon fuels. Carbon dioxide emissions have lowered the pH in the oceans, causing acidity to rise faster than in the past 300 million years. Ocean acidification is one of the three big stressors on the oceans alongside warming and decreasing oxygen concentrations. Several other stresses include overfishing and eutrophication which makes more depletion of oxygen in the water. Together they create significant challenges for ocean ecosystems. After oceans absorb carbon dioxide from the atmosphere, and turn it into a carbon acid, this dissolves the carbonates needed by some organisms, like corals, oysters or the tiny snails salmon eat. Carbon dioxide is absorbed by seawater, lowering the pH level and increasing its acidity. In preindustrial times the ocean's pH was 8.2. It has already gone down to 8.1. Depending on what we do, it will reach an average of 7.7 by 2100. It hasn't been that low for 55 million years. The ocean is a key food supply for more than 3 billion people. Along the coasts and out in the deep, huge "dead zones" have been multiplying. They are the emptiest places on the planet, where there's little oxygen and sometimes no life at all, almost entirely restricted to some unicellular organisms like bacteria. Vast blooms of algae-organisms that thrive in more acid (and less alkaline) seawater and are fed by pollution have rendered parts of the ocean waters much dead. But that uptake of carbon has come at a price. Human-caused carbon dioxide emissions in the atmosphere are being absorbed by the ocean and may have pushed local waters through a "tipping point" of acidity beyond which shellfish cannot survive. Chemical reactions caused by that excess CO2 have made seawater grow more acidic, depleting it of the carbonate ions that corals, mollusks and calcifying plankton need to build their shells and skeletons. Rising ocean acidity is a global phenomenon, made worse by higher natural acidity in local waters. High acidity interferes with the ability of baby scallops to form a protective shell, forcing them to expend more energy and making them more vulnerable to predators and infection. Over the past years, scallop operations big and small are reporting die-offs. Mysterious scallop die-offs have also been reported in China since'96. Oyster larvae started dying inexplicably in 2005. Deep water welling up from the depths of the ocean was mixing with surface water rich in carbon dioxide from the atmosphere, rendering the water uninhabitable to some shellfish. By the end of this century, thousands of sea creatures making up dozens of species may be history due to man's reckless abuse of the planet. Near Greenland in the North Atlantic, salty, dense, ocean water issuing from the tropics along the Gulf Stream begins to cool. The heavier water, burdened with salt, sinks to the bottom in the North Atlantic. This drives a massive ocean conveyer belt, driving less oxygen rich bottom waters to the surface where they can be reinvigorated. It also drives this ocean revitalizing train of currents through every major corner of the global ocean. However, this salt and heat driven (thermohaline) circulation could be disrupted, reducing oxygen levels throughout the global ocean system, and greatly reducing the oceans' ability to support life. This disruption could be caused by warmer, salty water cooling and sinking in the North Atlantic. And any disruption of the overturning process in the North Atlantic basically kills off a life-giving circulation to the entire global ocean system. Marine life now faces numerous threats even more serious than overfishing. While ocean ecosystems are still largely intact, the marine world is facing unprecedented disturbance, including acidification from the absorption of greenhouse gases and widespread habitat destruction from deep-sea mining, oil and gas drilling, development, and aquaculture. We seem to be on the verge of transitioning from an era in which harvesting and fishing of marine resources has been the main driver of impoverishing biological diversity to one in which massive habitat change and, global chemical warfare (acidification) may be waged on the oceans. It has become a lot harder to recover and the impacts are going to be more profound. Many other examples of human activities impacting critically on life can be observed in coral reef cover, the way that fish farming is eating up mangrove forest, the amount of factories such as oil rigs and other platforms that we are building in the oceans for energy production. Human encroachment is shrinking the world's rain forests. Africa is a leader in destructiveness. Scientists today worry about global warming that is expected to dry up and kill off vast tracts of rain forest, and dying forests will feed global warming. The burning or rotting of trees that comes with deforestation sends more heat-trapping carbon dioxide into the atmosphere than all the world's planes, trains, trucks and automobiles. Forest destruction accounts for about 20% of man made emissions. Healthy forests absorb carbon dioxide and store carbon. If we don't start turning this around in the next 10 years, the crisis will begin to spiral out of control. Intensive use of ecosystems often produces the greatest short-term advantage, but excessive and unsustainable use can lead to losses in the long term. A country could cut its forests and deplete its fisheries, and this would show only as a positive gain to GDP, despite the loss of capital assets. If the full economic value of ecosystems were taken into account in decision-making, their degradation could be significantly slowed down or even reversed. Amazon deforestation jumped 72% last year because of rising demand for soy and cattle pushes farmers and ranchers to raze trees. The global economy is losing more money from the disappearance of forests than through the banking crisis. The annual cost of forest loss may be as much as $6 trillion, from adding the value of providing clean water and absorbing carbon dioxide. Forest decline could be costing about 8% of global GDP. As forests decline, nature stops providing free services and human economy has to provide them through building reservoirs, facilities to sequester carbon dioxide, or farming foods that were once naturally available. The cost falls disproportionately on the poor. The greatest cost to western nations would come through losing a natural absorber of greenhouse gas. A number of nations are beginning to direct funds into forest conservation, and there are signs of a trade in natural ecosystems developing, analogous to the carbon trade. The counter-argument is that decades of trying to halt biodiversity decline by arguing for the worth of nature have not gained much results. When a country becomes overpopulated, it gives rise to unemployment as there are fewer jobs to support a large number of people. Rise in unemployment gives rise to crime as people will steal various items to feed their family and provide them basic amenities of life. As difference between demand and supply continues to expand due to overpopulation, it raises the prices of various commodities including food, shelter and healthcare. This means that people have to pay more to survive and feed their families. The 2016 urban populations of a few nations are listed here according to the size of their contribution to world's population. Together these nations make 43% of the total world population and 79% of the world urban population. 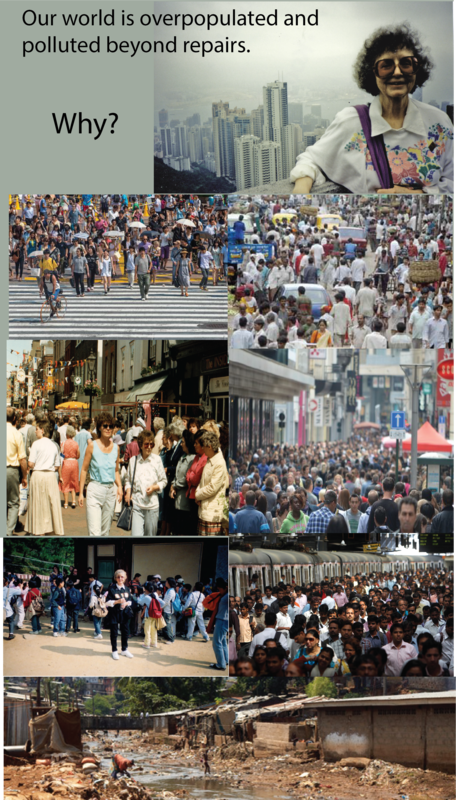 Urban populations make up megacities, and many of them are called hypercities because inhabited by more than 20 million people. Despite the increase in population density within cities and the emergence of megacities, urbanization may be the best compromise in the face of global population growth. Cities concentrate human activity within limited areas, limiting the breadth of environmental damage. But this mitigating influence can only be achieved if urban planning is significantly improved and city services are properly maintained. Urbanization is often considered a local issue, however the direct impacts of future urban expansion on global biodiversity hotspots and carbon pools are significant. The world will experience an unprecedented era of urban expansion and city-building over the next few decades. The associated environmental and social challenges will be enormous. By 2035 urban areas will expand by more than 1.5 million square kilometers per day. The urban growth will include the construction of roads and buildings, water and sanitation facilities, and energy and transport systems that will transform land cover and cities globally. Nearly half of the increase in urban expansion is forecasted to occur in Asia, with China and India absorbing 65% of the regional total. We need to rethink conservation policies and what it means to be a sustainable city. We need to consider how urban expansion will have implications for other, nonhuman species and the value of these species for present and future generations. Urban expansion will encroach on or destroy habitats for amphibian species, mammalian species and bird species. There are several mitigation measures that have been or can be applied to reduce overpopulation. All of these mitigations are ways to implement social norms. In societies like China, the government has put policies in place that regulate the number of children allowed to a couple. Other societies have already begun to implement social marketing strategies in order to educate the public on overpopulation effects. The intervention can be widespread and done at a low cost. A variety of print materials such as flyers, brochures, fact sheets, stickers need to be produced and distributed throughout the communities such as at local places of worship, sporting events, local food markets, schools and at car parks. Those strategies work to introduce the problem so that social norms are easier to implement. Certain government policies are making it easier and more socially acceptable to use contraception and abortion methods. Another option is to focus on education about overpopulation, family planning, and birth control methods, and to make birth-control devices like male/female condoms, pills and intrauterine devices easily available. Worldwide, nearly 50% of pregnancies are unintended, and that is about 100 million unintended pregnancies each year. Women in the poorest countries of the world either did not want their last child, do not want another child or want to space their pregnancies, but they lack access to information, affordable means and services, to determine the size and spacing of their families. Spacing means timing between the first child and second child if there is going to be a second one. Women's rights and their reproductive rights in particular are issues regarded to have vital importance in the debate. Wherever women are put in control of their lives, both politically and socially, where medical facilities allow them to deal with birth control and where their husbands allow them to make those decisions, birth rate falls. Religious and ideological opposition to birth control has been cited as a factor contributing to overpopulation and poverty. Financial compensation or other benefits including free goods and/or services by the state could be offered to people who voluntarily undergo sterilization. Such compensation has been offered in the past by the government of India. A community-based family planning program has made birth control options like the pill accessible and affordable. Distributors are able to sell pills and condoms anytime. In just a few years from the time of establishing such a program, family sizes will drop quickly. The program shows how closely tied family planning is with environmental conservation and putting food on the table. In many places where birth control remains largely out of reach, the struggle to put food on the table from one day to the next dominates life. People have to collect government assistance checks for food. In countries where people are mostly Catholic, the Catholic church leadership opposes any form of artificial contraception and has rallied for a long time against a reproductive health bill in government that would guarantee universal access to birth control. Investing in family planning services is an even more cost-effective way to abate CO2 emissions than previously thought. Reducing future energy demand by preventing unwanted births in developed as well as developing countries is far cheaper. The benefits multiply in perpetuity via each never-existing person's never-existing descendants. Furthermore, by reducing the sizes of future populations, the same dollar spent has many other benefits: improving food and water security; reducing soil degradation and desertification; helping to prevent civil conflict and mass migration; protecting biodiversity; empowering women; improving health; stimulating economic development; and reducing unemployment and poverty. There is an urgent need to make voluntary contraception available so that women and their families are able to live healthy, productive lives. Women in the world would like to plan the number and spacing of their children, but currently are not able to because they don't have access to modern contraception. Providing voluntary, rights-based family planning could be a global solution for women, their children and the climate. The additional health, education and economic benefits that accompany family planning would reduce the vulnerability of the children to the impacts of climate change and build their resilience. Increased funding for family planning programs in developing nations is the most effective way to avert the worst impacts of climate change. Slowing population growth would slow demand for coal, oil, and natural gas, and the need to manufacture goods, generate electricity, fuel transportation, and power agricultural production. Improved access to family planning would reduce emissions every year between now and mid-century. Funding for family planning services would also help solve global hunger; currently 800 million people are underfed. Without improved access to contraception and abortion, the world population could reach 15 billion by 2050 and 32 billion by 2100, resulting in even more widespread hunger, as well as devastating climate change. Here is a short summary list of actions and strategies that will reverse population growth nationally and worldwide. Empower women and families to plan how many children they want. About 200 million women in the world would prefer to delay having children but do not have access to contraceptives and reproductive healthcare. With modern life-saving medicine has come modern contraception. We need to provide services and accurate information to the people who really want it, and elect politicians who promise to do so in their own nation and worldwide. Provide education and job opportunities, especially for women. These are critical components for alleviating poverty, gender inequality and overpopulation. Studies have found that when women have more education and job opportunities, they choose to have smaller families, and are able to invest more in each child which helps break the cycle of poverty. Ask our politicians and international organizations to help provide education and jobs worldwide. Educate the public to be aware of environmental and social cost of overpopulation. Children are truly wonderful, and caring for them is a challenging and rewarding experience. But parents can keep in mind that every person must be cared for within the constraints of the local and global environment. Develop and implement social norms. Refrain from pressuring people to have children if they are not ready or prefer to remain childless. Some cultures value large families. This often suited a sparsely-populated farming or pastoral region, and sometimes remains as a holdover from those times. Measures can be taken to model and emphasize the benefits of smaller families. Let's not glorify teen pregnancy with TV shows and tabloid magazines. Additionally in affluent countries, we need to shift away from a culture of excess and unsustainable consumption. Make use of economic forces. Most people take their economic situation into consideration when planning their families. If they do not have housing and jobs they delay starting families. Better economic policies in conjunction with slowing population growth worldwide, can help increase global prosperity. Our usual measure of economic progress, Gross Domestic Product (GDP) has a built-in tie to population growth (i.e. more people means more economic transactions). This means GDP can rise with population while median household income (and well-being) actually declines! With the wrong measures we set the wrong goals. Let us redefine the GDP to take into account the benefits of a less populated world. The Global Protection Agency (GPA) provides leadership for training of other countries' citizens who would like to participate in peacekeeping and Earth security so that we have a ready cadre of people who are trained and equipped and organised and have communications that they can work with each other. As well, there are questions about how many nations would sign up if such a force were under the control of Global Parliament . To act as a global policing force, as the GPA aspires to do, many foundations must be laid, especially regarding the move from wielding power derived from Global Parliament to legitimate global leadership. In a company this might mean the CEO fires a slacking employee. In a city, the police may jail a murderer. On a global level, this might even mean arresting those breaking global law . The defence function of a leader requires that he or she safeguards the good of the whole by whatever the most skillful means are to accomplish that defence. While that is not a comprehensive catalog of leadership prerequisites, I do think those few requirements are foundational and relatively unquestionable. Without at least a solid foundation of those requirements, the GPA’s actions among nation-states will remain those of a unilateralist leader rather than a global leader. We will be, and should be, legitimated in the role of a global leader among nation-states and validated as an enforcer of global law. Global Parliament offers a few recommendations for actions that would strengthen and legitimate the GPA’s role as a true global leader by gradually creating an international structure that better safeguards the whole than we can ever do now as a unilateralist leader. 4. Exert strong global leadership on multinational solutions to pressing health, environmental, overpopulation, and other global problems. We should propose innovative new solutions and show leadership in carrying them out, especially in areas such as clean energy development and overpopulation. As we enact global law, we will begin to take on a much deeper kind of global leadership, one that earns more respect than envy and more gratitude than hatred, one that can catapult the whole planet forward into a future where war is no longer thinkable between nation-states and a legitimate and beneficial global government is able to cope with global problems such as overpopulation. I believe that there is no greater task in the world today than for Global Community to proceed through the maturation of its leadership, emerging from a more self-interested adolescence as a global leader into a nobler adulthood. We have the potential to act as a torchbearer for a better tomorrow. Do we heed the call? I hope this message has convinced people that the question of how to proceed with that maturation is of far deeper significance than the reforming of the United Nations. I thus pray that we move with wisdom, grace, clarity, and love in the days, years, and even decades ahead.